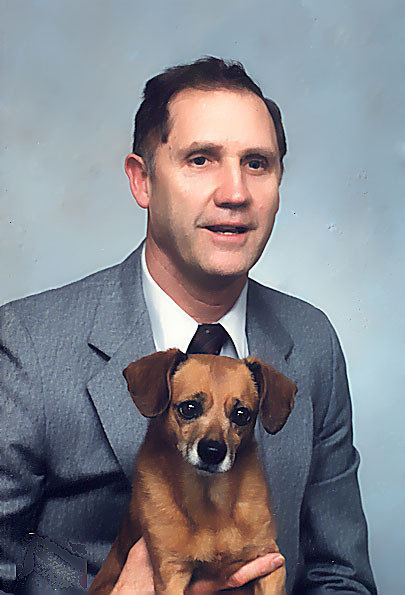 David Carl Peterson, 85, passed away in his Pleasant Grove home on March 21, 2019. He was born on September 25, 1933 in Bakersfield, CA to Basil Hyrum Peterson and Winifred Mary Dooley. David worked many years for the Department of Energy as a purchaser at the Lawrence Livermore Laboratory. But his true loves were his family, dogs, basketball, travel and sharing his love of life and the Gospel of Jesus Christ with anyone who would listen. He and Linda spent his last 25 years serving missions, traveling, and visiting family and friends. He could be found cheering on a grandchild at a sports or musical event, walking a neighbor’s dog, cooking or enjoying a lamb roast or lobster, organizing neighborhood Easter egg hunts, or visiting a family on the hillside in Chile or Argentina or wherever he happened to be. His enthusiasm, generosity, and cheery disposition will be missed by many. He is survived by his wife Linda, children: Dave Peterson Jr., Lanae (Steve) Hooper, Elisa (Kurt) Kennedy, Doug (Summer) Peterson, foster daughter Tessie (Wilson) Crosby, 18 grandchildren, his brother Richard (Norma) Peterson, and many beloved nieces and nephews. He is preceded in death by his parents. Funeral services will be held on Saturday, March 30, 2019 at 10:30 a.m. at The Church of Jesus Christ of Latter-Day Saints at 1136 West 700 South in Pleasant Grove, Utah. A viewing will be held prior to the service from 9:30 a.m. - 10:15 a.m. at the church. A graveside service will be held the same day at 3 p.m. at Huntsville Cemetery at 5600 East 100 South, Huntsville, 84317.